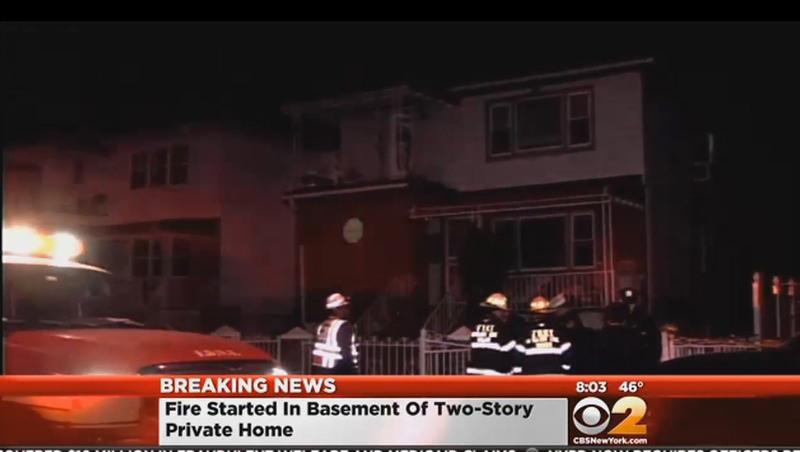 NEW YORK - A basement blaze that killed 4-year-old half siblings was accidentally set by children playing with fire, authorities said Sunday. The twin of one of the children survived the blaze that was reported to authorities just before midnight Saturday in a two-story brick home in the Far Rockaway section of Queens. Khalid Baylor, spokesman with the Fire Department of New York, said the fire was accidental, but he wouldn't elaborate on exactly what caused it. CBS New York reported that police said the children appear to have been playing with a lighter near a bed. Within minutes of police and firefighters arriving, the children were carried outside and rescue workers tried to resuscitate them as neighbors watched. The fire was under control less than an hour and a half later. Two 4-year-olds, a boy and a girl, were pronounced dead at St. John's Episcopal Hospital. Police identified the boy as Jai'Launi Tinglin and the girl as Ayini Tinglin. They shared the same father. Their 4-year-old sister - Jai'Launi's twin - was hospitalized in stable condition at St. John's. The children's 63-year-old grandfather and a 55-year-old woman were listed in stable condition at other hospitals. The woman's relationship to the others is unclear. A firefighter who suffered a minor injury was treated and released from a hospital. At St. Patrick's Cathedral on Sunday, Cardinal Timothy Dolan offered prayers for the children who died in the fire. "We hold up to the Lord the needs of those for whom this Easter Sunday morning might still seem like the darkness of Good Friday. We think of that family that lost those two little children in the fire last night here in New York," Dolan said. The fire occurred in the seaside community of Far Rockaway, a narrow strip of land hit hard by Superstorm Sandy in October 2012, when fires destroyed dozens of homes as the ocean met the bay. On Sunday afternoon, neighbors placed teddy bears on the lawn where hours earlier there had been a frantic effort to save the children. "It's sad. I cried. They're babies. They're angels. It's not a happy Easter for me," neighbor Sharon Bouyea told CBS New York.